Gutting another stuffed toy. | Can I Bring the Dog? 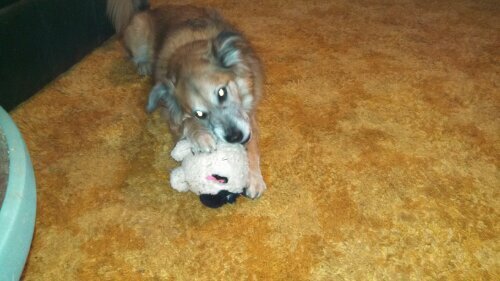 This stuffed sheep came from a thrift shop, twenty-five cents, and Chico is having the best time pulling the stuffing out of it. I’m jumping ahead again, but we’re visiting Buddy and his person, Jimbo, and the two pups are getting along very well. Chico doesn’t touch Buddy’s goose and Buddy doesn’t even look at Chico when Chico has the sheep or investigate the sheep when Chico isn’t busy with it. They are taking turns chewing a knuckle bone, something Buddy would normally bury. And having another dog around has made Chico into quite an energetic eater and daily dinner-finisher. A guy can’t afford to be such a picky eater when there’s an eighty-five pound pooch close by who’d be glad to finish anything that you don’t care for.